After you master the ability to focus your mind, you are ready to begin hedge riding. However, like any journey you take, you must make sure you are prepared prior to leaving. Just like you would pack a suitcase with clothes and toiletries to travel across the country, you must also make sure you are prepared to journey into the Otherworld. Once you are protected, it is time to prepare for your ride. Begin by making sure you are in the correct setting. Is your environment conducive to hedge riding? You will require peace and quiet for your journey away from the daily distractions, especially that damned cell phone of yours. I find it best to hedge ride when no one is home. You may even need earplugs to block out that blasted dishwasher or fridge hum. I lock my cats out of the room because they tend to want to try and bring me home instead of helping me travel deeper. I know it makes Jane, my kitten, nervous when I leave. 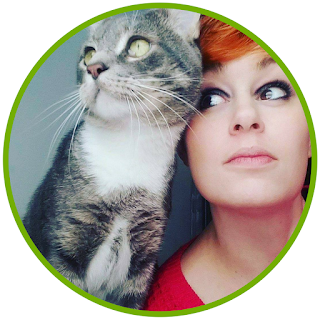 She tends to paw at my face, attempting to keep my firmly grounded instead of traveling too deeply into the Otherworld. I appreciate her concern, but it is very distracting. Make sure where ever you are going to ride is temperature controlled. You don't want to be too hot or too cold. Either will disrupt your ability to stay focused. Furthermore, decide if you are going to sit or lie down. You need to be comfortable enough to relax, but not so comfortable you fall asleep. You'll also need to decide if you want to wear clothes or not. I love to hedge ride in a warm bath surrounded by candles and crystals. I also enjoy hedge riding at night while laying in my bed with the full moon coming through my window. It depends on my mood and time of the month, but I strategically plan each ride and ensure I am comfortable prior to traveling. You may also decide to light some candles and incense. There are several scents that can help you reach an altered state of consciousness, including the famous mugwort. 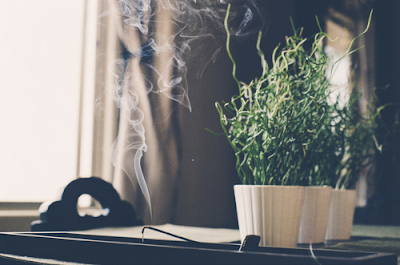 There are even some incense blends on the market named "astral travel." While I haven't personally used this blend, I have a feeling it is likely effective in setting the mood to travel to the Otherworld. Much of the principals of astral travel apply to hedge riding, so any incense or herb for spiritual travel should work. Other than mugwort, I find cinnamon incense helps me travel fairly well. You may find lavender or orange blossom helps you travel. Sometimes our personal correspondences are more important than what a book says it is. Finally, decide whether or not you will use shamanic drumming, a rattle, or chanting to aid in your travels. I prefer shamanic drumming. I find that if I just have to listen to the drums instead of actively participating in the drumming, rattling, or chanting, I am able to reach an altered state of consciousness must faster. When everything is all nice and set, be sure to ground yourself. This helps to ensure you have one foot firmly placed in our world so you can easily find your way back. I find the best way to ground is to either stand barefoot in the yard or hold my black tourmaline tight, envisioning my connection to Mother Earth through the roots in my feet (or hands if I am holding a crystal). Are you protected? Comfortable? Grounded? Great! Now let's set a purpose. Why are your going on this journey? When you hedge ride, you should always have your purpose firmly set in your mind. This will help you remained focused on your intent and give your animal guides or spirit guides a heads up that you are coming. Are you wishing to have a question answered? Repeat the question several times in your mind. Looking to grow spiritually? Concentrate on the growth you seek intently. Always make sure you ask your guides to meet you in the Otherworld when you arrive. Again, they are needed to protect you, and will likely have the answers you seek or at least know where to find them. You can hedge ride for a variety of purposes, including divination, healing, spell work, knowledge, or meet with your ancestors. I find healing and knowledge to be the two main reasons I hedge ride. Occasionally I go seeking answers, but usually, these answers, while masked as divination, are actually to help me heal from past injuries and hurts. Hedge riding is a great way to heal yourself, especially from emotional injuries. Remember, you must learn to heal yourself before you can heal others. My favorite way to heal myself is to swim in the lake inside of my Garden. The cold water is refreshing and filled with magical healing properties. If I hedge ride in the bath at home, it doesn't matter how hot the bath may be when I enter the pool in the Garden, my whole body feels the cold shock. Sometimes it is hard not to be shocked back into our realm. It is truly invigorating. While hedge riding is great for healing, it can't fix everything. If you broke your arm, I'm sorry but you need to go to the hospital all the same and have a doctor set the bone. Furthermore, it is unwise to hedge ride if you are sick. Stay at home and take care of yourself on in our realm first. There is nothing worse than a fever induced hedge ride. Trust me...I am ashamed to say I did this once, but in all honesty, it was completely accidental. However, in some cases, it is okay to hedge ride while ill. If you are suffering from allergies or a simple cold, feel free to travel on. Furthermore, many people find hedge riding while fighting cancer to be beneficial as well. It's a great way to deal with the emotional stress, but only if you are feeling up to it. Use common sense. To aid in spell work, you can focus on things like increasing protection, strength, or even to seek help to overcome an obstacle. Being around your guides is enough to give you a sense of purpose and drive. If you are looking for knowledge, seek out your guides for answers. Again, they will either know the answer or know someone who will. Keep in mind that our guides do not communicate the same ways we do. You may notice they never actually speak to you, but instead show you a variety of images. This is why it is so important to write down your journeys so you can interpret the meanings when you come back to Earth. You may need to hedge ride a couple of times before the answer becomes clear enough for you to understand. Be patient. The answer will come in time. 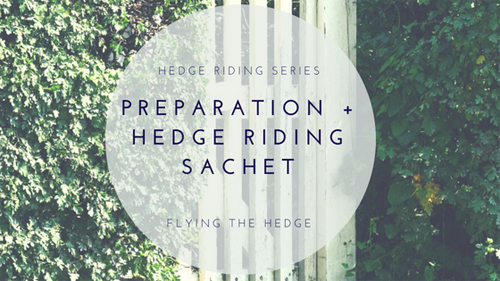 One of the items you will likely wish to create solely for hedge riding is a hedge riding sachet that you will carry with you each time you ride. Historically, medicine men and women carried medicine bags, which usually was a drawstring bag with a variety of items for a variety of purposes. Written in the thirteenth century, Erik's Saga, of which two versions are preserved, Hauksbók and Shalkholtbók, there is mention of a such a magical bag. In this story, a priestess named Völva carries a skin pouch full of magical items. You too can create such a bag. The items contained within can be used for protection, aiding in hedge riding, grounding, or for luck. You sachet is designed for you, by you for whatever purpose you deem. It can also contain items to represent the elements or your animal guides to increase your connection with them. My bag is a compilation of items, some of which hold great meaning to me. Any item that is important to you will increase your magical workings, no matter what the item. So, how do you make a hedge riding sachet? Start with a bit of cloth or a drawstring bag. 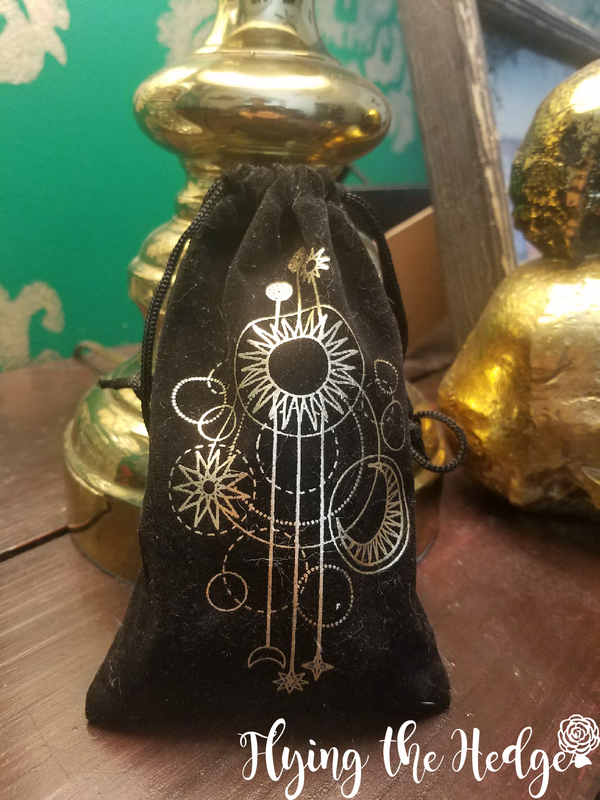 Recently I was given a pouch in one of my subscription boxes that I decided would be my new sachet bag. Before I used a plastic baggie and then a piece of fabric. It is really whatever works for you. After you have figured out what you are going to use to store your items, begin deciding what you wish to include in the bag. 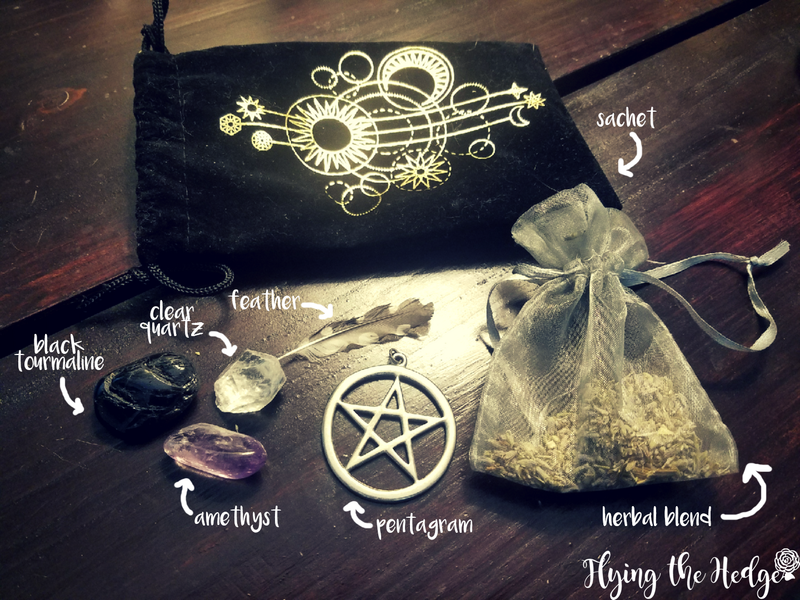 You can include herbs, crystals, features, runes, jewelry, pictures, coins, small trinkets, amulets, or anything else you can think of. Whatever you put in the bag should be kept private. DO NOT LET ANYONE TOUCH YOUR ITEMS. Every item should be cleansed and charged prior to entering your sachet. Furthermore, do not let these items touch the ground. Preferably leave them in the bag, on the cloth, or in your hand or on your body in some way. In time, your sachet will become increasingly powerful. You may add or remove items as you see fit. Looking for ideas? Here's a peek inside my hedge riding sachet! Traveler's Loose Incense: contains copal, mugwort, damiana, calendula, and jasmine to aid in hedge riding. I use it as a nosegay prior to riding. I am adding and subtracting from my sachet as I feel the need. This is a living entity, so as you grow, so will it. It can include ANYTHING you desire, so make it personal! Aww ! Thank you for reading!